The story of 10-year-old Auggie Pullman and his family. Auggie has Treacher Collins syndrome, which means he has facial differences. He has been homeschooled all his life and is about to start going to a public school with other children for the first time. Hollywood doesn't often produce great live-action family dramas with universal appeal for kids and adults. Movies like this have to strike a balance between being entertaining enough for children and having more mature issues to captivate an older crowd. They can't be overly sentimental. They can't have too much low-hanging humor that only children will find funny. Some movies that meet these criteria are "My Girl," "Bridge to Terabithia," and "October Sky." 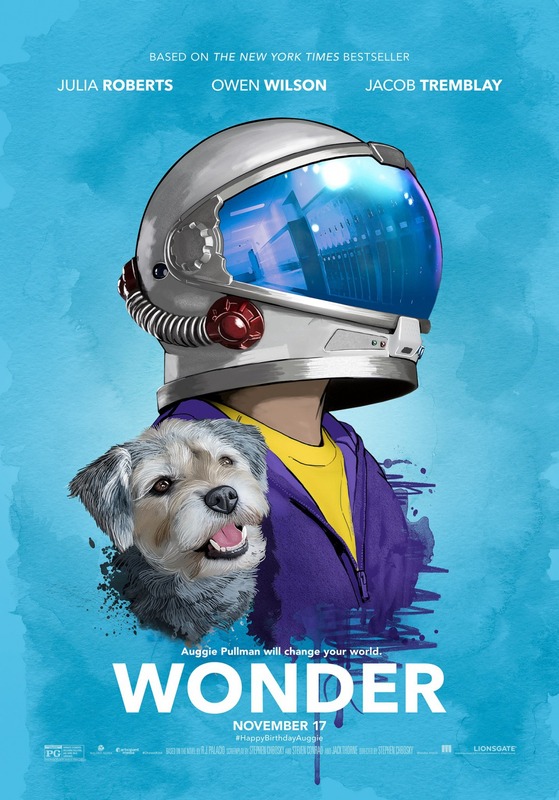 "Wonder" is also a movie that falls into this category and is a timely story that deals with being "different," adversity, bullying, and kindness. It is directed by Stephen Chbosky and is based on the best selling novel of the same name by R.J. Palacio. It stars Jacob Tremblay as August "Auggie" Pullman, who looks a bit different because he was born with a genetic defect that has required him to have numerous surgeries in his young life. Joining him are Julia Roberts and Owen Wilson as his parents Isabelle and Nate, as well as Izabela Vidovic as his older sister Via. Also in the film are Noah Jupe, Bryce Gheisar, and Millie Davis, who play Auggie's classmates named Will, Julian, and Summer. Auggie is about to attend school with other students for the very first time as he has only been homeschooled up to this point. As we all know, kids aren't always so understanding and are not kind to people who are "different." "Wonder" is an endearing and charming drama with a lot of heart, a good amount of humor, and a fantastic message. Jacob Tremblay is quite the actor and puts on a wonderful performance as Auggie Pullman. He shows a great, wide range of emotion well beyond his years. We can't say we are really surprised by this considering his past work in the film "Room." Beyond Tremblay's performance, the rest of the acting is also really good as Julia Roberts, Owen Wilson, and Izabela Vidovic are all excellent supporting cast members. Each of them gives moving performances in different ways. The other child actors are all fantastic as well. Noah Jupe was one of the best things about the movie "Suburbicon," and here, he plays Auggie's reluctant-at-first friend Will who comes to realize Auggie is more than someone to be pitied. Millie Davis gives a splendid performance as Summer, who says she wants to have nice friends for a change instead of means ones, so she starts hanging out with Auggie one day at lunch. Finally, Bryce Gheisar plays Julian, Auggie's biggest schoolyard antagonist. Gheisar plays this part tremendously, and even though we absolutely hate his character, we become a little sympathetic to him as facts about him are revealed. Dramatic films like this are often hokey, forced, and disingenuous. "Wonder" is the exact opposite and feels completely sincere. It is a total tearjerker, one that really earns each of its sentimental moments. The story has a wonderful, topical message that's extremely relevant to our current social climate. Bullying and treating people unkindly have been problems for centuries and these issues still persist today. We went into this film not expecting much. We didn't enjoy the trailer and thought it was very maudlin. We left the theater elated with what we had just watched. "Wonder" is an important movie for kids and adults of all ages. It teaches the importance of kindness not just to those who are perceived as "different," but to everyone at all times because we are all going through things each and every day. It has brilliant acting, great makeup work, and will hit you right in the feels.